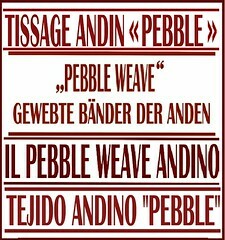 One of the most exciting things for me about finishing a pebble weave piece is looking at the other side. Sure, I do take a peek at it when I first start the piece but I try not to do so again until I have the finished fabric off the loom. Nine times out of ten, I am astonished that I like the other side better but I think that just comes from having gotten so used to seeing the “right” side. I decided to finish it with some very simple twining rather than twine a motif as originally planned as I felt it would look too cluttered. I am still deciding on whether to edge it with tubular bands and I am not sure what to do with the fringe. I do like the look of a full fringe and, as it will be a wall hanging, it shouldn’t cause problems but then, I like braids too. Maybe I should let it sit for a while and see what it says to me! I have spent most of the time after taking this off the loom charting and sampling motifs for the next chamanto-inspired piece. I have been looking at examples online and trying to figure out scale in my charting. As I have mentioned in other blog posts, chamantos are ponchos woven in one particular region of Chile which have come to be part of the national costume of the huaso, the Chilean cowboy. That was at an APEC conference in 2004. Imagine all those participants each with their uniquely patterned poncho. How I would love to see each and every one up close. 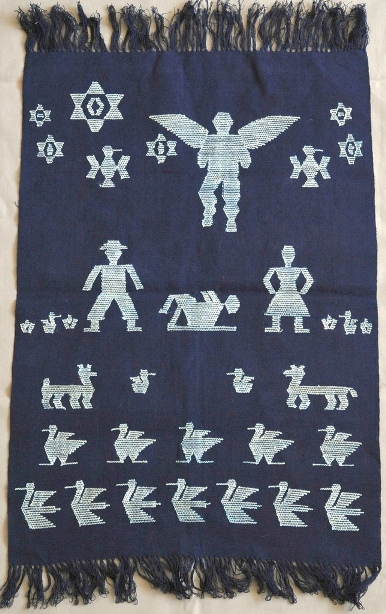 I have seen a few of the motifs repeated from one chamanto to the next. There are certain flower and leaf designs that turn up quite a lot but each weaver creates her own unique piece in her choice of colors and layout. 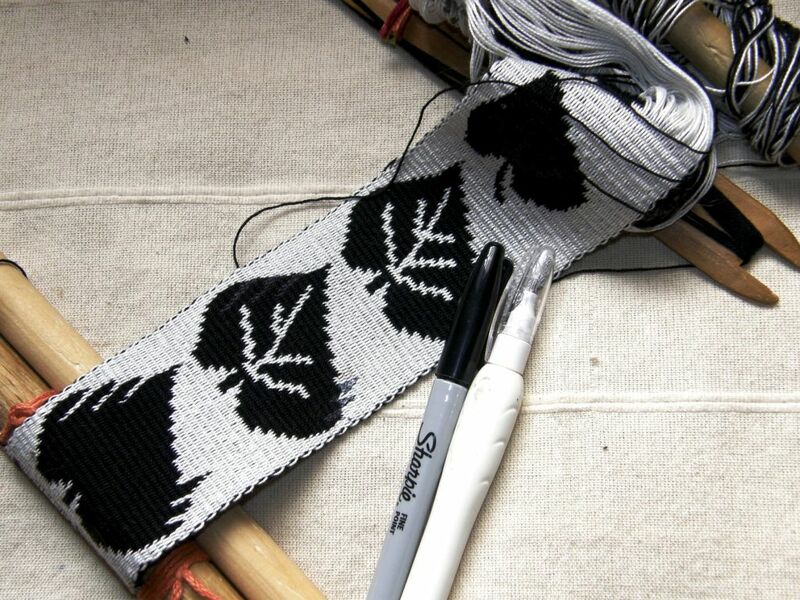 I hope to use my adaptation of one of the grape leaf patterns in my next wall hanging and so I have been charting and weaving, correcting, charting and weaving and using two of my handy sampling tools…my black Sharpie and white correction pen. With these I can make adjustments on the cloth before changing my chart and trying again. I know that the Chilean weavers use much finer thread than I do as I am not able to get as much detail as they do in motifs of the same size. 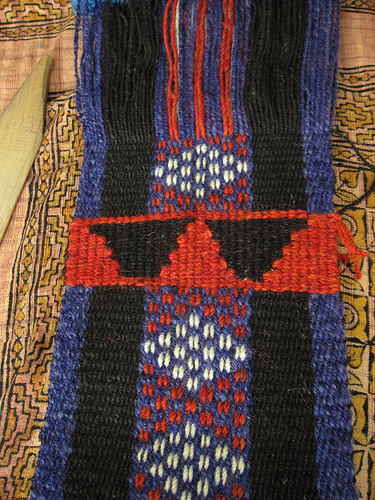 I also know about the thread they use as I got to see one of the ponchos, which was woven without pick-up patterns, at the exhibit of Chilean crafts in Washington DC recently. The striped warp-faced ponchos are called mantas. So, that is my next project. I have made my calculations…my goodness, what a job that was. My head just wasn’t functioning well the day I got the calculator out and I made a fine mess of it but fortunately caught all the blunders before I got the warp off the stakes. I warped my piece in three sections. 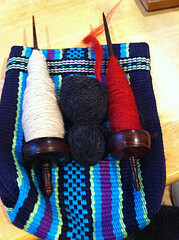 Here is the first one completed and about to be taken off the warping stakes. Above you can see the first section placed on the loom bar and wire that I use in place of a header cord. And then you can see the three sections on the floor on the loom. What I do next is transfer the cross on all three sections to one long pair of cross sticks and lash the wire to a loom bar. And now I am ready for heddle making. While tidying up the other day I came across this ball of very fine nylon that weaver Deb McClintock gave me a long time ago when I met her at the MD Sheep and Wool Festival. From what I remember, she brought this from Laos and gave it to me as I was interested at the time in having a bamboo reed made and this is the thread that the reed makers in Laos use to space the bamboo slivers. Well, I didn’t get the reed made as I managed to buy two beauties and so I am thinking of trying this as heddle string. You might already know that I hate nylon for heddle string although all my Guatemalan weaving teachers use it happily. It’s just that I haven’t tried any as fine as this and would like to see how it goes. I hope it works as there are a heck of a lot of heddles to make! So, there I was planning and planning, but, you know what?…a bit of spontaneity is good too! And that is what hit us thanks to Tracy in the Ravelry Backstrap Weaving Group last weekend following my blog post with the tutorial for warping the traditional Bedouin al’ouerjan patterns. Tracy suggested a warp-along for the weekend and a few people jumped in with enthusiasm while others watched-along and cheered. 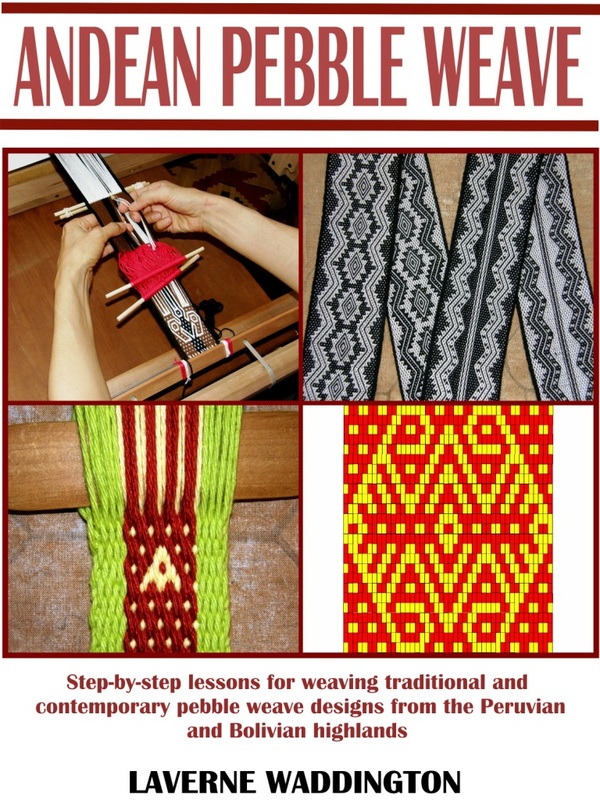 Some people chose to use the seven-square warp above right for which I gave instructions in the tutorial while others warped wide pieces with several strips of al’ouerjan patterns in different widths. Some used their handspun wool, Tracy used handspun wool that she bought in the Souk in Doha, while others used crochet or perle cotton. We had both traditional and non-traditional color combinations, Some didn’t quite get it straight away but soldiered on and were able to declare success by the end of the weekend. It was fun. Janet used her handspun. I love the way the grey looks against the red and white. 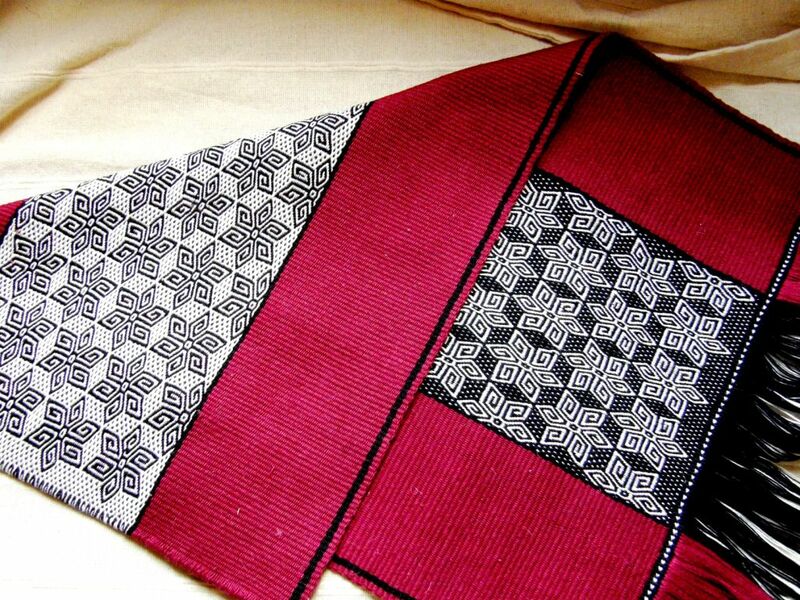 Renate Petra chose the three-square warp and wove what I call the triangle design. She admits that the design would show better if she had chosen colors with higher contrast but the design is there and she has done a great job. Above left is Tracy’s piece made from handspun wool she bought in the market and on the right is another piece she warped using perle cotton that she happened upon. What a contrast! Tracy has difficulty tracking down suitable yarn in Doha and so is constantly coming up with these surprise finds. 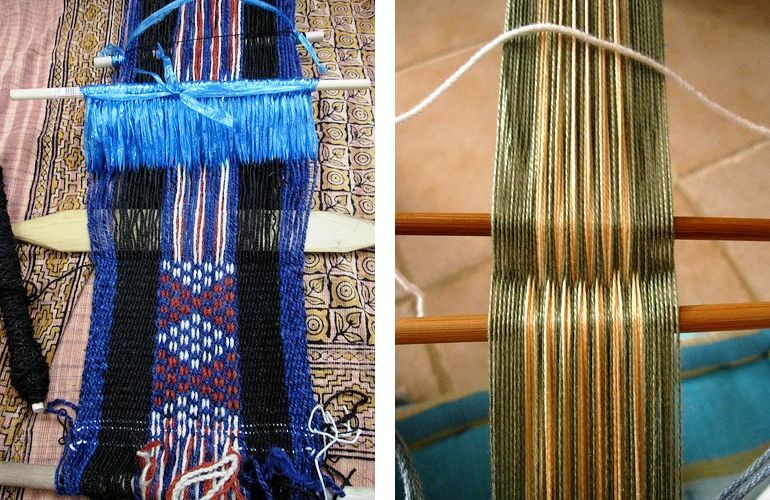 Jennifer really went to town warping up three projects, the first with three strips of al’ouerjan pattern, and partly weaving two of the warps. I think Traudi was the last to jump in but she finished her band and even did some weft twining along the ends. And then Tracy added some twining to the mix…. Maybe some day we will be making things like these…. 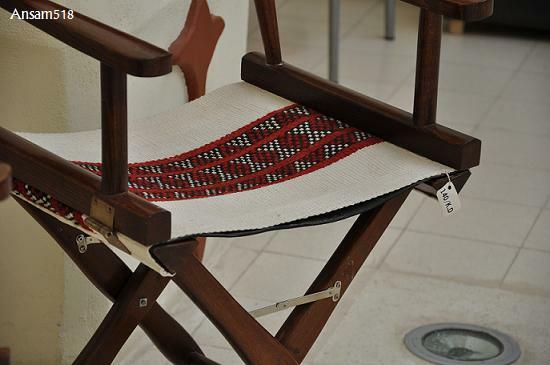 Look at the beautiful al’ouerjan patterns in this chair seat fabric. It looks like there will be more black, red and white on the horizon. Jennifer has just showed us her loaded spindles with yarn waiting to be warped for her next project (once she gets her three warp-along pieces done, I suppose). 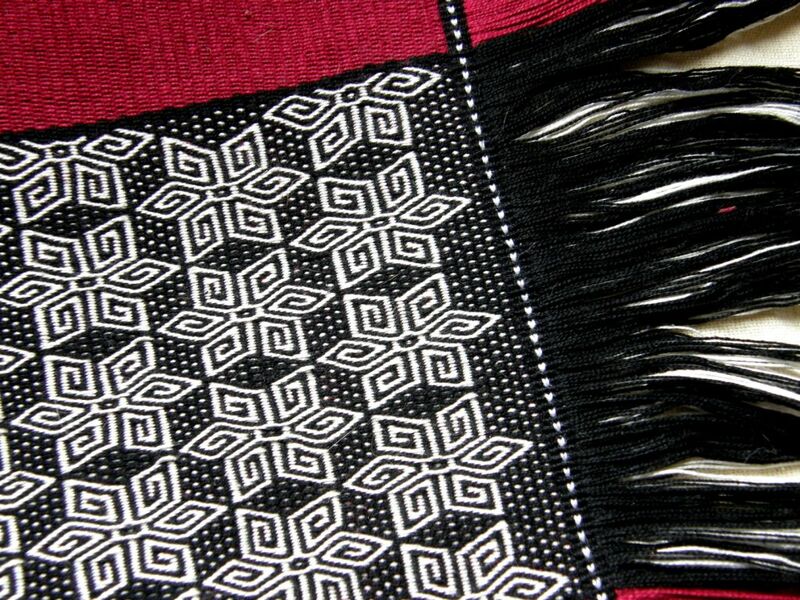 You may remember my showing you how one of the features of the warp substitution technique, by which the al’ouerjan patterns are created, is the creation of long warp floats on the back of the textile. We may find them bothersome but obviously the Bedouin people don’t. 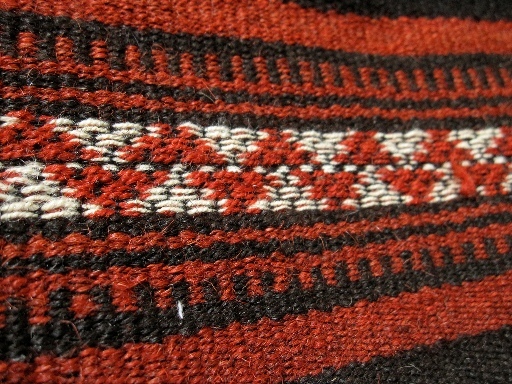 You may also remember that Tracy showed us an Omani textile, which was made for sale in a textile cooperative, on which the weaver had used a clever way to secure the floats. 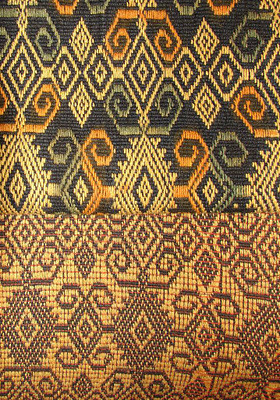 Having seen all this, Phil from the Ravelry group posted a picture of a textile that was collected on a trip to Indonesia. This textile forms part of the greater collection of his and the late Dennis Penley’s now owned by C.Philip Willett. You can see the front and back of a warp-faced textile patterned with supplementary warp floats. Now, I would have been there forever scratching my head trying to figure out how they managed those color changes if I had only seen the front of the textile. 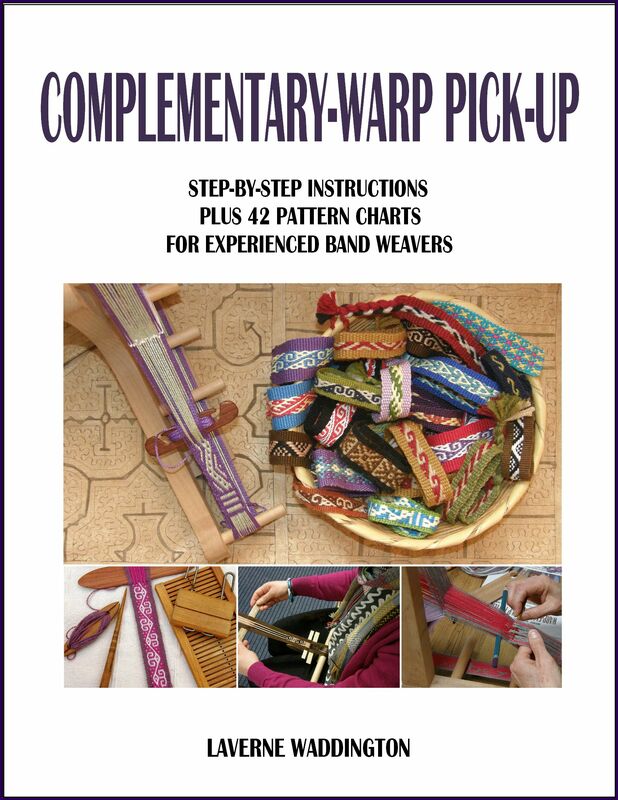 At first, I thought I was looking at supplementary weft floats as the image had been posted side on which didn’t make the color changes difficult to understand. There are two faces to every story, right? 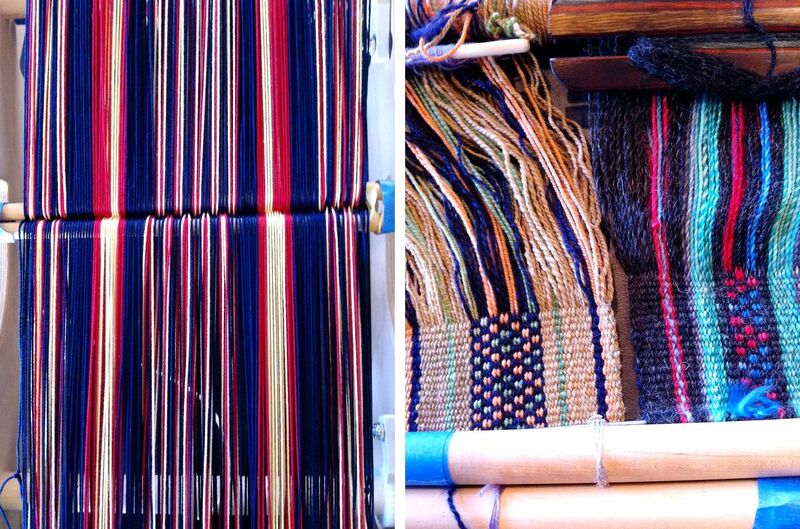 And then Janet took a look at both front and back, figured out that the picture should be turned around, and that we were looking at warp floats which were all woven in off-white and then colored orange and blue after the weaving was completed. 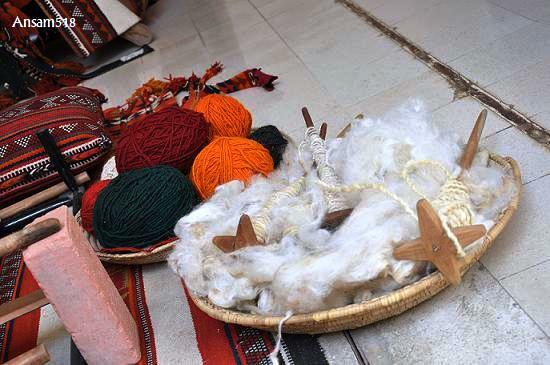 The long floats on the back are secured by a red weft in much the same way, I would imagine, as the Omani weavers in the cooperative are securing the floats on their pieces. Of course Phil already knew all this and was teasing us by not telling! Dyeing the warps after the weaving? This had never occurred to me. At first I was rather disillusioned by what I perceived as “cheating”. But, then again, all sorts of embellishment can be added to a piece of fabric once it is off the loom…embroidery, stamping, beadwork, painting, resist dye patterns to name just a few so why is this any different? 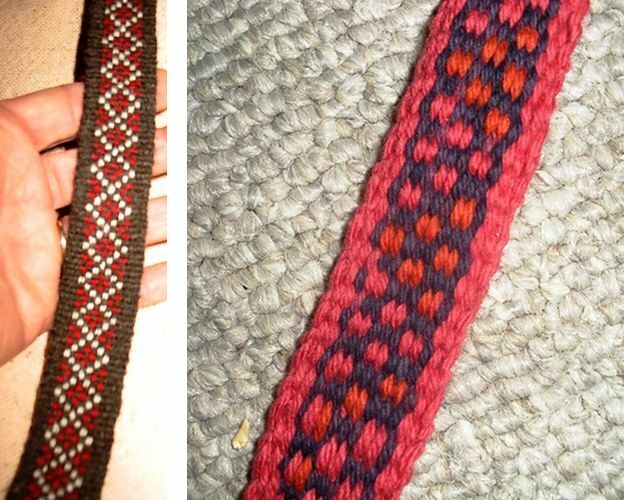 Tracy and Pam shared pictures of their backstrap weaving set ups. 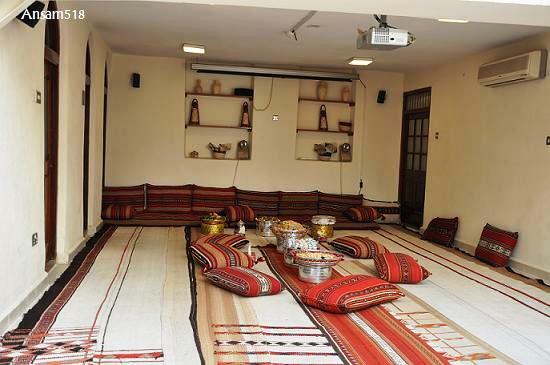 It is always helpful to show these kinds of pictures to give people ideas of what they can do in their homes. Tracy gets down on the floor while Pam sits up on her sofa. She sits cross-legged (jealous!). Tracy made some adjustments by adding an extension to her far loom bar as she said that she was tired of banging her head on the table as she neared the end of her warp. Pam was fed up with the card table always toppling over and so has wood pieces wedged between it and the sofa. 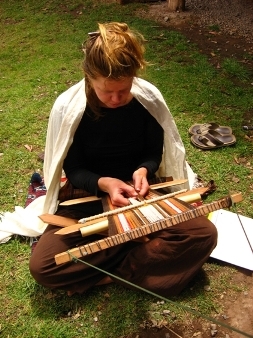 And here is super flexible Karla weaving in Chinchero where she was working as a volunteer for the CTTC. She looks perfectly at home there, doesn’t she? Another super guitar strap by Annie MacHale. 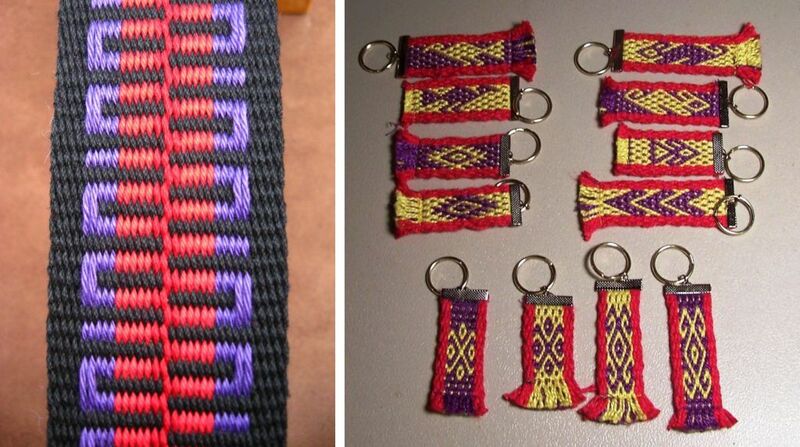 Pam made a bunch of keyfobs from a pebble weave band she wove using four-shafts on her table loom. I like the hardware. Those tabs just clamp onto the ends and the rings are added…one little bit less sewing to do and less band used up in what would normally be fed through the ring and sewn down. 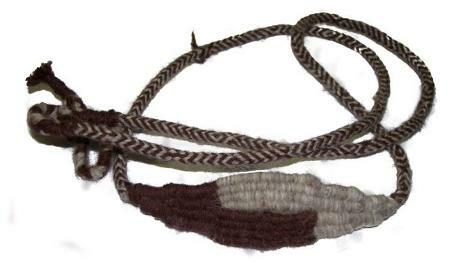 Ben has not only been braiding but has been making entire Peruvian-style slings. Here is one of his latest ones…. It looks to me like the Margarita braid but don’t take my word on it…there are so many variations to these braids and I would hate to give you the wrong information. I will have to ask Ben about that. This one comes to you via Kaz Madigan who writes the curiousweaver blog. 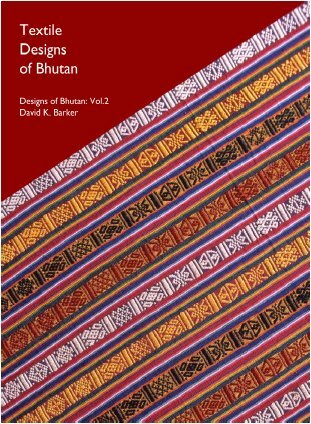 This link is for a free download of David K Barker’s 2nd Volume of Textile Designs of Bhutan. I have the first volume which I don’t think exists as a download but which can still be purchased as a hard copy. The file is 73MB and even I with my erratic internet connection was able to get it quite quickly and with no interruptions…lucky! 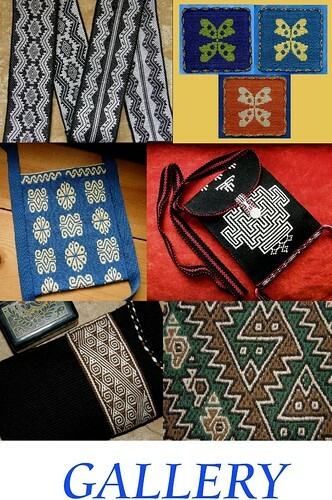 And on the subject of Bhutan, this is a link to a blog which I recently found and which I think is sure to develop into an incredible textile resource. 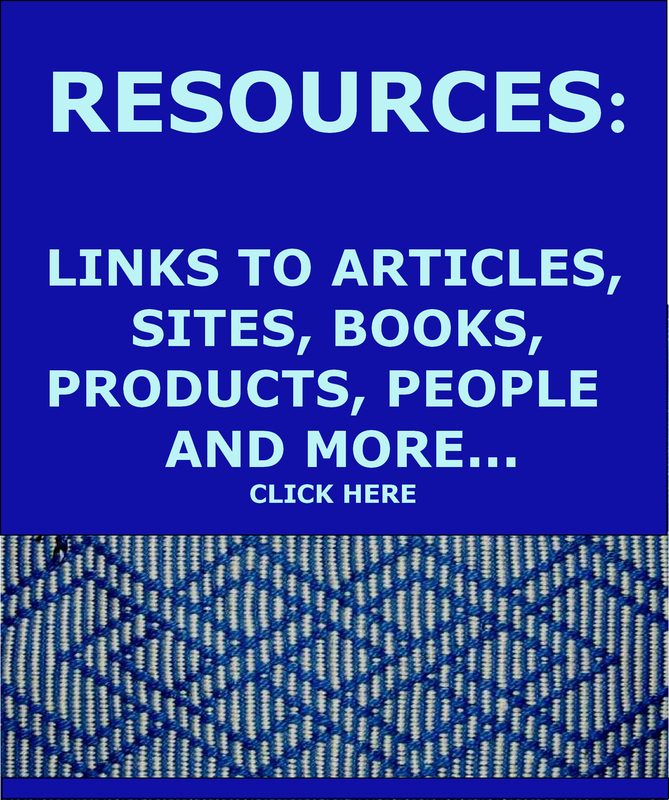 I have been trying to contact the author, Wendy Garrity, but I guess that she is out of internet contact and can only get online now and then to add to and update her information. I would love to talk with her and know more about her life. 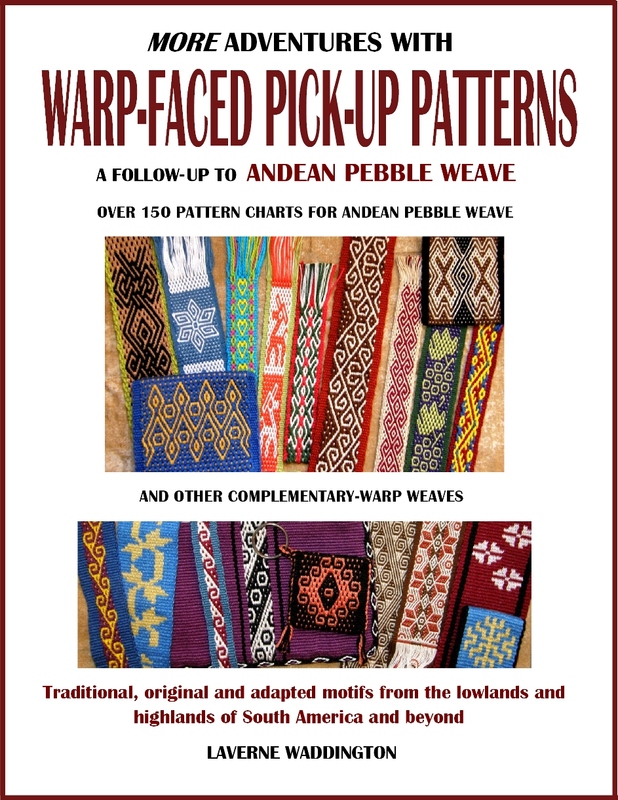 And finally, a little information about my book, Andean Pebble Weave. The download is available as usual from Patternfish.com with the version in German here. And then there is the follow up book that I am working on! I like the black background best, I think. Very dramatic. Love the simple twining – a perfect finish edge! I am glad that we have been able to connect at last.I will email you. Yay! I made your blog! I showed my parents and they think I’m famous now. I also like the black background best. The stars seem more like stars. The first of many appearances I am sure! You are right about my star piece…stars should be white.